I am on it ! · I should advise that mobile ‘phone reception isn’t good and is non-existent in the lecture room, although you can usually get a signal just up the road – but don’t rely on it!! · Don’t rely on using the post code on Sat Nav. It won’t take you to the right place, so please do familiarise yourself with the map. · When: Saturday 25th & Sunday 26th July - 9.30 am start time, finish by 5.30 pm each day. · Course content: Breakdown of the weekend is attached. Should you have any further queries please email: pete@beeswales.co.uk and I shall try to answer them. 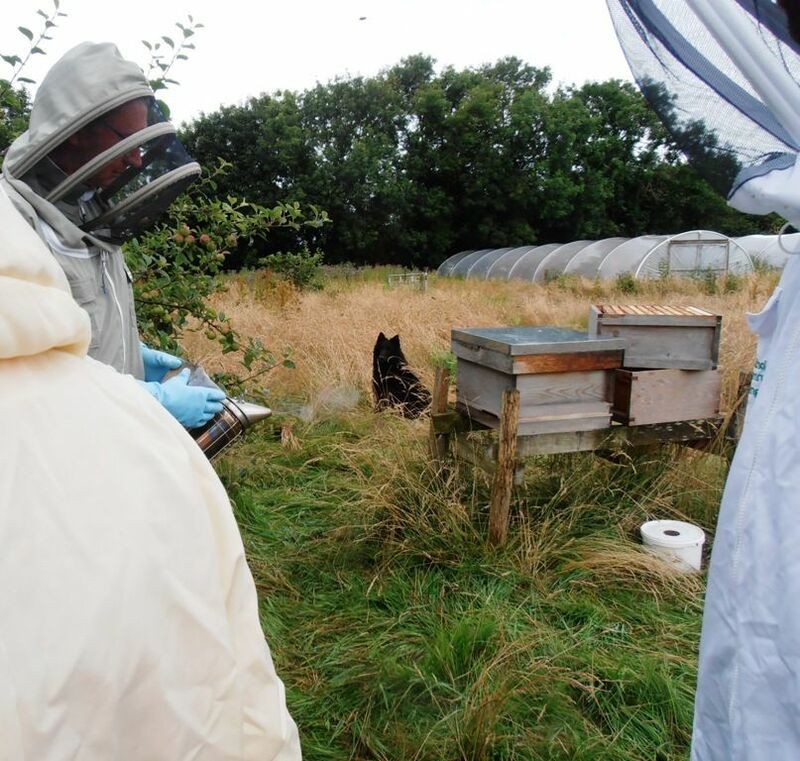 · Who is delivering the course: Mike Lax of Conwy and Anglesey Beekeepers’ Associations. You will be supported during the course by Keith Arnold, Holly Pinkney and Pete Barrar. · Handouts: We will provide a 5GB pendrive with a copy of the course presentation slides but you may like to bring a notebook and pen for your own notes. All protective clothing and equipment will be provided, but if you have your own, then please bring them if you wish. Please bring along wellingtons and if you have one, your beekeeping suit and gauntlets for when you are in the apiary. If you don’t have them, don’t worry, we have sufficient for you all. For those of you who don’t yet have a book, the recommended course text book is by Ted Hooper and it’s called ‘Bees and Honey’. It is very comprehensive, but not really a beginners book in my view. It is also written for the Anglo-American market and I find the American angle doesn’t really fit in a UK context. You can get it from either Northern Bee Books or Amazon i.e. http://www.amazon.co.uk/s/?ie=UTF8&keywords=haynes+bee+manual&tag=googhydr-21&index=stripbook s&hvadid=5930560556&hvpos=1t1&hvexid=&hvnetw=g&hvrand=15116951631518035189&hvpone=&hvptwo=&hvqmt=b&ref=pd_sl_34p1k63bbg_b#/ref=nb_sb_ss_i_1_13?url=search-alias%3Dstripbooks&field-keywords=guide+to+bees+and+honey&sprefix=guide+to+bees%2Cstripbooks%2C285&rh=n%3A266239%2Ck%3Aguide+to+bees+and+honey You should make sure you go for the latest edition to ensure you get the latest advice on pest management, particularly varroa control methods. If you have any queries at all please do not hesitate to contact me by email or on 07711 576722 and in the meantime we look forward to see you on the 25th. how to assemble the fiddly expensive national hive parts that you buy also covered...very useful. anyway i looked and thought well no point wasting lecturerers BUSY BEE TIMEs to approve or not these videos they are harmless...and very nice spontaneous bits of sharing of hive b vies views...ouff using french keyboard i make a few errors sometimes ...but i can use adequately german englsih or french keyboards i add ! Video 7 ? uploading still. just one photo of ONE of my BLACKIES...dogs but there are hundreds of thousands more of blackies in BEES also . Bees are Us. Learning is a lifelong process, never too late to start. Speaking for myself ! Video 7 ? 7th Heaven ! Happy Bottoms Up Bees ! oh my oh my ! i have just emailed my friends etc in exceitment ! i AN NOW OFFICIALLY A GUARD BEE ! I TOO AM A GUARDIAN NOW ! it is official ! excuse my excitemenbt i have had A PROMOTION ! jaja ! to GUARDIAN ! purr purr ! buzz buzz ! woof woof ! ok the big forum of uk beekeepers have deleted again my post of welsh bee center video list due no doubt to my negative comment ref NATIONAL HIVE design and costs..but ! they also deleted the offensive to me comments made by some other forum members keen on supporting bayer pesticides company they no doubt get freebies off ...and ! on the BIOBEES FORUM ! wow ! and i got off to a bad start there ! they are highy critical and suspicous of me generally there but ! they left alone my list of welsh bee center videos...and upgraded me to a GUARD BEE because i have made 50 POSTS !!!! I am now a GUARD BEE !